How Can You Help Your Parent Cope with Fatigue with Parkinson’s Disease? Fatigue is a very serious symptom of Parkinson’s disease. 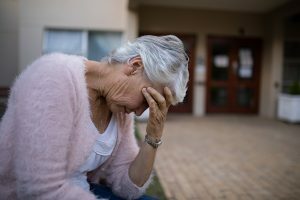 Approximately half of those living with Parkinson’s disease report that they regularly suffer from fatigue, and around 30 percent say that the fatigue they experience is the most debilitating of all of their PD symptoms. This is often one of the earliest symptoms of the disease and can worsen as the disease progresses. As a family caregiver, you should not only recognize if your parent is suffering from fatigue, but also take the steps you can to help them cope so they can maintain better quality of life. Reassure them that they are not being dramatic. Fatigue is more than being tired or feeling sleepy. Fatigue is deep physical or mental exhaustion that interferes with daily functioning. Help your parent understand they are not exaggerating, and that this is truly a serious issue. Encourage your parent to eat a healthy, balanced diet. This gives their body the nutrients it needs to thrive, and produces more reliable energy. Help your parent to stay hydrated. Being dehydrating can emphasize exhaustion and also make regular physical and mental functioning more difficult. Encourage your parent to be more active. Though it may seem difficult for your parent to think about being active when they are so drained, the more physical activity they get, the better their body will feel, and the more energy they will have. Work with your parent to establish a sleep schedule for them, and make sure they follow it. Going to bed at the same time and waking up at the same time each day, even on weekends, is important for teaching the body when to sleep and when to be awake. Schedule the day so your senior handles their most challenging tasks when they are most energetic, and has time for breaks. Discourage long naps or naps in the late afternoon. One of the best parts about elderly care is the completely customizable nature of the services. An elderly home care services provider can step into your senior’s care routine to offer exactly the types of care, assistance, and support they need to manage their specific challenges and issues as they age in place. This means that their needs will be met in the ways that are right for them, while they are also able to continue to pursue the type of lifestyle they desire. The customizable nature of the services also means they are fully adaptable. As your parent’s needs change, particularly if they are living with a progressive issue such as Parkinson’s disease, their care will need to change as well. An elderly home care services provider can continuously adapt with your parent to maintain their health, safety, comfort, and quality of life as they age. If you or an aging loved-one are considering professional elderly care in Clarksville, MD, please call the caring staff at Global Hands Inc. Call today 240-264-0769. This entry was posted in Elderly Care in Clarksville MD, Health Issues, Parkinson's Disease and tagged Elderly Care in Clarksville MD. Bookmark the permalink.